What appealed to you about playing Bette Davis? Bette has been popping up forever since I was a kid and she actually asked me to do a film about her once. She approached me through a director I had worked with. I was intrigued then but there was no script and I didn't have the wherewithal to make it happen. Ryan Murphy came to me initially with this idea as a film project but it just seemed to me at the time like a one joke story - that these two women were so bitchy to each other. Then when Ryan reinvented it as eight hours for TV, it was a more complex, in-depth view - not only of these women - but of what produced the feud and what it says about Hollywood and aging. Then it had a context for me that was much more interesting - how it talks about the ups and downs of their lives, but also asks some bigger questions. It had something else besides us just doing an imitation of Bette Davis and Joan Crawford. And also, Ryan’s initiative of having half of the episodes directed by women really appealed to me. How did you prepare for the role? What were some of the challenges? The good thing and the bad thing about playing someone so well known, is that there is a wealth of books and interviews out there - and all of the films of course. 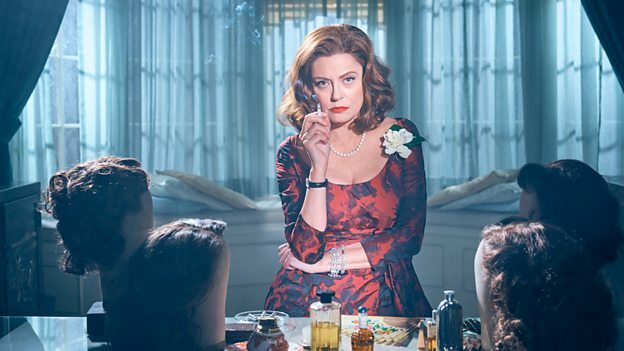 But it was intimidating because Bette was so eccentric in terms of the way she talks, idiosyncratic in the way she does and says everything. It wasn’t just about getting the accent - she stressed very odd words all the time and she also had a very odd walk. I had to think, how do you take that character that everybody is acquainted with the most extreme version of, and how do you ground her and make her a real person? That's what was scary. You can learn an accent but when you're paying attention to that - and Jessica felt the same way - you know, how do we make these real women, who were so over the top, seem like real people and not just a caricature? And that's what terrified me. But then, I’m always drawn to things that terrify me. If you could have a drink with Bette, what would you say to her? What would you want her to know? I’d just listen and ask more questions and maybe learn something from that. In terms of changes in the industry, we are in a state of flux and there are good intentions, but a lot of the results remain unseen at the moment. At the time of filming Whatever Happened to Baby Jane? Bette and Joan were only 50, yet they were seen as ‘washed up’. What do you think when you put that in perspective today? Well, it certainly hits a chord, I mean, I think when I started out acting, I thought that I'd be over by 40. I think a lot of us that have survived pushed the gate a little bit further down, but it's still a fact that there's a lack of imagination in terms of people coming up with stories. With Bette and Joan, these women were always after quality parts and they fought for that from the beginning of their careers, and that's how they ended up at this point in their lives when they couldn't find a decent part. Then, with Whatever Happened to Baby Jane? - these were two big parts and a new genre - and they said, “Okay, let's try it. We don't have much choice.” That was a risky thing. What was it like working alongside Jessica Lange? I've been very lucky to do a few other films where there was another woman or two women in the lead, but it's very rare. I mean, that's why Thelma and Louise, The Banger Sisters and Tammy were a big thing for me. It's great to have another woman to play off of, no matter what the part is; it's just a whole different experience.